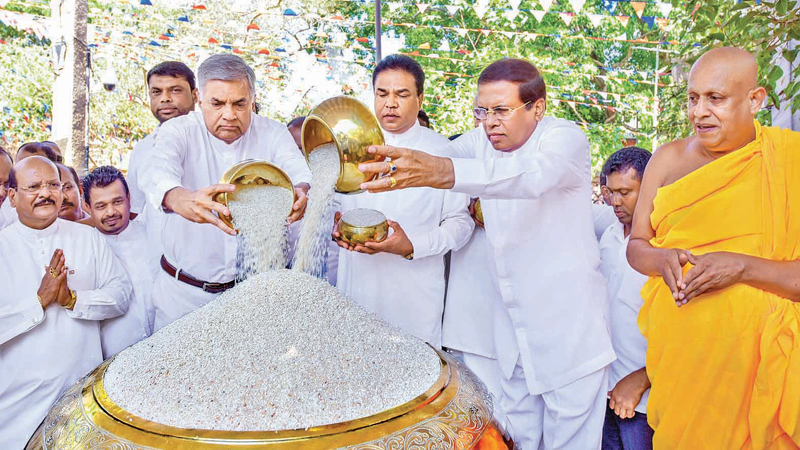 The 52nd Aluth Sahal Mangalyaya (New Rice Festival) was held at the Anuradhapura Sri Maha Bodhi premises with President Maithripala Sirisena and Prime Minister Ranil Wickremesinghe participating as Chief Guests. Around 5,000 farmers from all districts came to the sacred venue in a colourful procession carrying bowls of rice for filling the historic plated bowl (Maha Pathra). Speaking to farmers at the event, the Prime Minister said the government was determined to serve the farmer community by providing them with subsidised fertiliser and expanding irrigational water supply such as Yan Oya and lower Malwathu Oya reservoirs. “After the ancient kings, late leaders like J.R. Jayewardene and Dudley Senanayake were instrumental in building large reservoirs including the Mahaweli Development Project. Now President Maithripala Sirisena has started a new chapter in the irrigational and agricultural history with the Moragahakanda Reservoir project for resolving the irrigational and drinking water shortage in the Anuradhapura, Polonnaruwa, Kurunegala, Vauniya and Jaffna districts,” the Prime Minister said. He said that the largest paddy production in the recent agriculture history was recorded in the 2018/2019 Maha season with a harvest of three million metric tonnes of paddy. Agriculture Minister P. Harrison, NCP Governor Sarath Ekanayake, Parliamentarian Duminda Dissanayake, the Agriculture Secretary, Agrarian Services Commissioner, and Anuradhapura Government Agent R. M. Wanninayake were present, while Uruwarige Wannila Aththo, the leader of the Veddah community, offered a casket of bees honey to the President according to the tradition.